With doors opening at 5:30 p.m. and a different show beginning at 6:30 p.m. nightly, the festival formally showcases an amazing repertoire of mountain performers – old-timers as well as the newest generation of bluegrass and mountain string bands, ballad singers, storytellers, big circle mountain dancers and cloggers – who share music, dance and storytelling that echo centuries of Scottish, English, Irish, Cherokee and African heritage. Audiences at each of the three performances will see an extensive line-up of the cream-of-the-crop musicians, ballad singers, storytellers, and dancers; each evening features at least four dance teams from the very young to the young at heart. The popular and long-standing house band, the Stoney Creek Boys, returns to perform each evening. And each night of the festival features both well-known musicians and new talent alike, representative of the Southern Appalachian Mountains and its continuing traditions. Proceeds from ticket sales for the Mountain Dance and Folk Festival help to cover the costs of the eight Shindig on the Green events each summer, including goods and services such as sound equipment and technicians. These operating costs average several thousand dollars per Shindig evening. The Folk Heritage CommitteeTM produces Shindig on the GreenTM and the Mountain Dance and Folk FestivalTM in order to support the preservation and continuation of the traditional music, dance and storytelling heritage of the Southern Appalachian Mountains. Thursday, August 3: Carol Rifkin and Jerry Sutton, Masters of Ceremonies; Introduction by Ed Herron; Grey Eagle (Stoney Creek Boys with Buck Dancers); Featuring: David Holt & Josh Goforth; Phil Jamison; Dance Team: Dixie Darlin’ Cloggers; Betty Smith; Bear Wallow; Sons of Ralph; Dance Team: Folk Heritage Smooth & Cole Mountain Smooth Dancers; Leonard Hollifield & Friends; Zoe & Cloyd; The Garnet Ridge Ramblers; Dance Team: Cole Mountain Cloggers; The Buckner Family; Carol Rifkin, Jeanette Queen & Mark Queen; The Peg Twisters; Dance Team: Blue Ridge Heritage Cloggers; Whitewater Bluegrass Company. Friday, August 4: Laura Boosinger and John Roten, Masters of Ceremonies; Introduction by Ed Herron; Grey Eagle (Stoney Creek Boys with Buck Dancers); Featuring: Laura Boosinger & The Midnight Plowboys; Bobby Hicks, Mark Kuykendall & The Asheville Bluegrass; Dance Team: Bailey Mountain Smooth; Richard Hurley; The Griggs; Don Pedi; Dance Team: Appalachian Mountaineers Cloggers; Honey Holler; Joe Penland; Dance Team: Southern Appalachian Cloggers; Lillian Chase & Friends; Clearwater Connection; Donna Ray Norton; Arvil Freeman & Emma McDowell; Maggie Lauterer and Zack Allen; Dance Team: Bailey Mountain Cloggers; The New Broad River Band. Saturday, August 5: Glenn Bannerman and Richard Hurley, Masters of Ceremonies; Introduction by Ed Herron; Grey Eagle (Stoney Creek Boys with buck dancers); Featuring: Roger Howell; The Waymasters; Bryan Sutton; The Cockman Family; Dance Team: Mountain Tradition Cloggers; The Ross Brothers; Rhiannon & The Relics; Dance Team: Folk Heritage Smooth Dancers; Buncombe Turnpike; Glenn Bannerman & Sit-Down Square Dance; Dance Team: Bannerman Family & Friends; Dance Team: Southern Mountain Fire Cloggers; The Southern Highlanders; Dance Team: J Creek Cloggers; Spirit Fiddle. Parking: Festival patrons can park in the adjoining Parking Garage and lot at no additional charge. 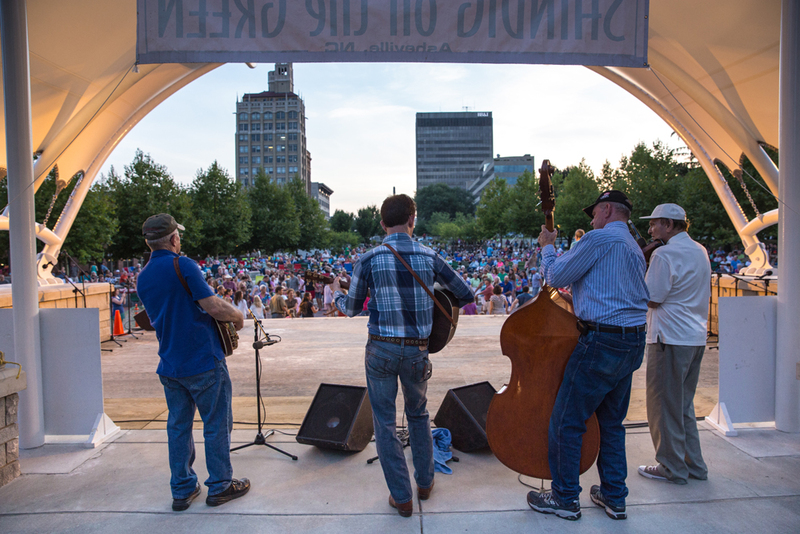 Sponsors: The Folk Heritage Committee produces Shindig on the Green’s 51st Summer Season and the 90th Annual Mountain Dance and Folk Festival with support from the following Corporate Sponsors: Blue Ridge Orthodontics; Brian C. Hunter, CPA, P.A. ; Brixx Wood Fired Pizza; Fox Dental Associates; Fred Anderson Toyota; Greybeard Realty; Harry’s on the Hill; Ingles; Luella’s BBQ; Mast General Store; Matt & Molly Team; Mosaic Community Lifestyle Realty; Pack’s Tavern; Parsec Financial; PNC Bank; Richard Hurley Music; Skyland Automotive; Timothy E. Gillespie, DMD, FAGD; Togar Rugs; Town Hardware & General Store; Verizon; William Hansen. Info Line: (828) 258-6101 x345.